A Watertown Department of Public Works sign at a storm drain shortfall. We appreciate our citizens on the look-out for potential sources of pollution in the Charles River, and it’s unfortunate that this resident had a difficult time contacting someone after hours. I’m not sure about the particulars in this instance, but we do receive calls after hours using an answering service. Furthermore, we are staffed 24-7 for emergencies. 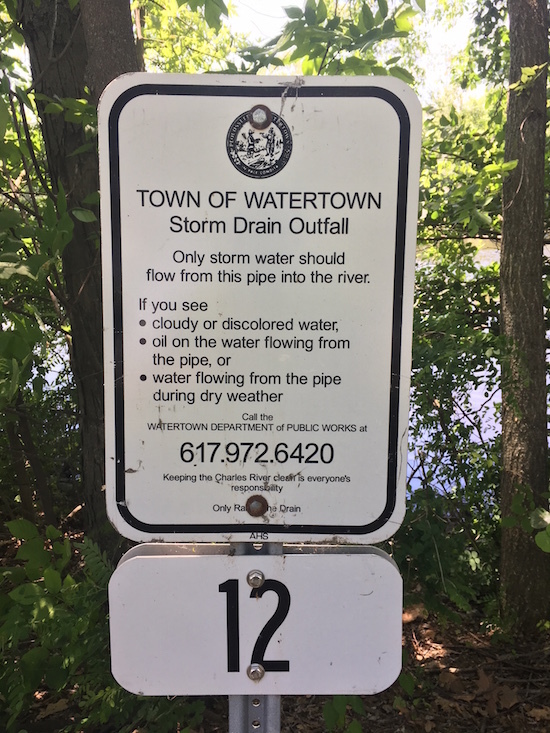 Also, all our storm drains that enter the Charles River (“outfalls”) have signs and a number attached to them (see the photo). It’s helpful when reporting potential pollution to include the outfall number as well, as this can help us with follow-up investigations. Our review of the photos and description provided in the article indicates that pollen is most likely the source of the yellowish substance in the water. Pollen in the river is fairly common at this time of year especially after rain storms. It is not harmful. We often get calls regarding foam in the river, particularly near Watertown Dam. Foam can be either natural or unnatural and is caused by a substance called surfactants. When organic substances, such as leaves or twigs, fall into the water and start to decay, surfactants are formed. They can cause air to more easily mix with the water and create bubbles. Not all surfactants are natural though. Manmade products such as detergents can also create foam, which may be harmful to aquatic life. Natural foams tend to form in the fall and spring, when plants lose their leaves and buds and decompose. Unnatural foams tend to have a white color, occur over a small, localized area, and sometimes have an odor. The number to call to report a possible spill in the Charles River is 617-972-6420.